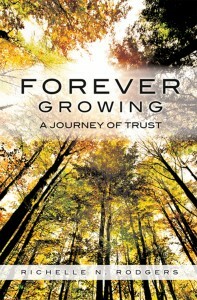 Within the pages of Richelle Rodger’s new book, Forever Growing – A Journey of Trust, readers will learn her secrets to living a full, focused, successful life—a life guided by the hand of the Master. As an author, public speaker and community leader, overcoming the legacy of the past and becoming a willing servant to the Lord is Richelle Rodgers’s greatest accomplishment. This autobiographical tale outlines the strength and security which can be found in complete surrender to the will and plan of God. It is an inspirational testimony to how a relationship with the Lord will guide you through overwhelming events into a life of achievement and fulfillment. Richelle’s relationship with the Lord and commitment to his service is the foundation of her life story. Surviving a childhood where a terrible act of violence penetrated family life, where poverty and racism could have drowned her, Richelle grew in strength and oveercame all obstacles to emerge victorious and will give a voice to those who are overwhelmed by despair and anger. Her inspirational writing and speaking will encourage those: changing their business or career, reinventing themselves, forced to start over or dealing with illness, domestic violence or hard times. Hope springs eternal in both Richelle’s writing and speaking as one who doesn’t just talk the talk but has walked the walk; tracing her life decisions, from the tragic death of her father at a very young age, to almost losing her spouse, to the beautiful birth of her triplet grandchildren. The author states “I think this book is written for young adults, adults and seniors who fall into two primary classifications, namely those who have either questioned their trust in God in this complex world due to major changes or crisis in their lives and those who have trust in God and just want a positive affirmation of this trust. However, my greatest hope is that this book touches and change at least one person’s life journey and I want to give a voice to those living with domestic violence, those faced with poverty, and racism. Copyright © 2019 Forever Growing.